WICHITA FALLS, Texas (AP) – Police in northern Texas say a woman has been banned from a local Walmart after spent she several hours driving an electric shopping cart around the store’s parking lot while drinking wine from a Pringles can. 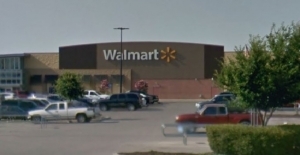 Police tell the Times Record News that officers responded to a suspicious person call at about 9 a.m. Friday at a Walmart in Wichita Falls, about 125 miles northwest of Dallas. Police eventually found the woman in a nearby restaurant and told her not to return to the store.